The major sources of funding for Nebraska State Soccer are youth and adult player and coach registration fees, and program-fees. The last time Nebraska State Soccer raised player registration fees was in 2010. In those 8 years, costs have continued to rise as demands have increased. As Nebraska State Soccer continues to grow and to meet our member needs, it is important we are financially responsible and put ourselves in a position to support our members. When a parent pays the club for their child to play, a small part of that fee covers what the club is obligated to forward to Nebraska State Soccer for those individual memberships (player and coach memberships). 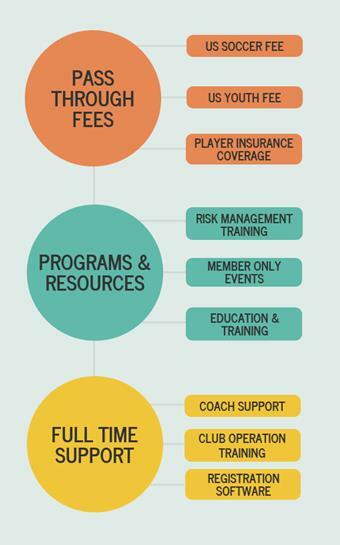 Included in the club's fee is the cost of the coach's membership, which by being assigned to coach a team within a club automatically processes a background check on that coach. When adults join a league, a portion of their fee goes to Nebraska State Soccer as well. Fee charged to "user" for participation in specific Nebraska State Soccer programs, such as coach education courses, tournaments, an entry fee for a league, camps and so on. Nebraska State Soccer has over 10 budgets that staff are required to develop annually. The yearly evaluation of revenue against expenses ensures that user-fee programs cover their expenses and that overall programming, services and benefits are covered by membership fees. Do you know what your membership gets you?